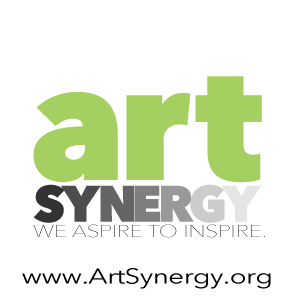 Stuart Art Supply is a full service specialty store selling fine art supplies to artists and students. Owner, Neil Capozzi provides a vast knowledge of art supplies, value pricing and a good selection of materials. 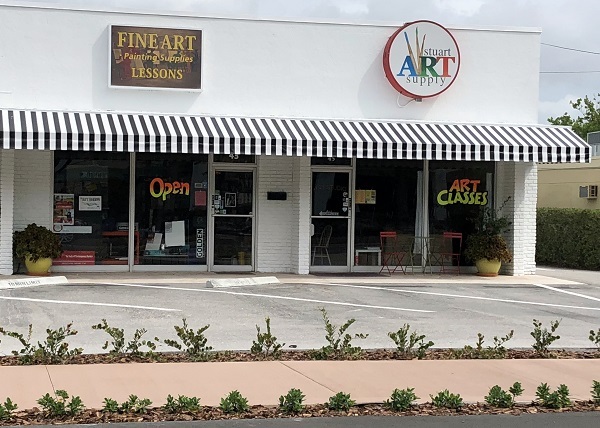 Stuart Art Supply is affiliated with the Artists’ Nook Studio, giving local art instructors a place to offer fine art classes and lessons. Neil shares his expertise about the countless options of brushes available. It is reassuring to have someone so knowledgeable to guide us, when the selection can be so overwhelming. From vegan brushes, white hog bristles, synthetic filaments, plus so many shapes and sizes, how does one decide? The Rickie Report shares the details and a Store Coupon! Neil Capozzi tells The Rickie Report, “My personal and business mission is to provide local artists with a great selection of quality art supplies at value pricing”. 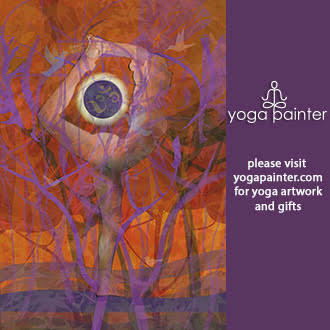 Neil is a major supporter of the local art scene, by bringing special events into the store and art studio. He is heavily involved as a volunteer with local arts agencies and organizations. 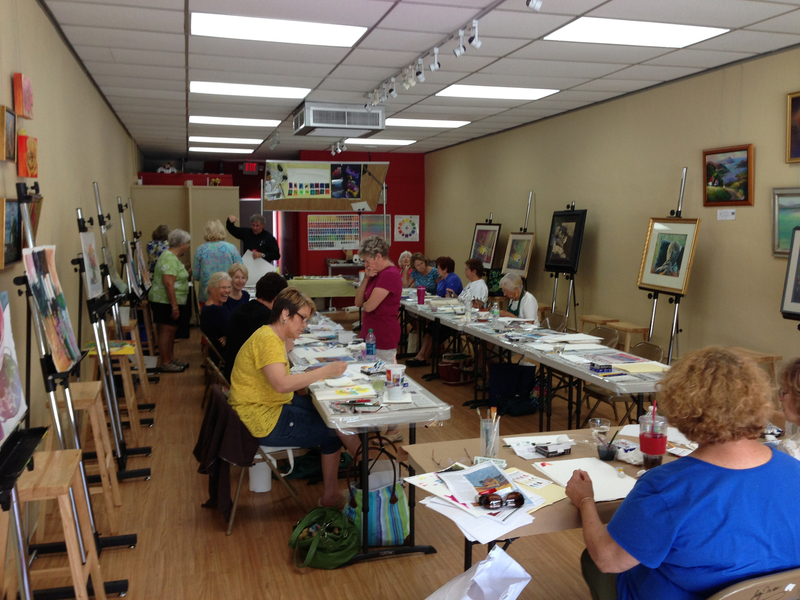 In addition, Neil provides affordable space for instructors to hold classes and workshops. He passes on his expertise by providing affordable art education to adults. Recently, Neil announced that he would be making changes in his artists’ brush mix eliminating Escoda, stocking Da Vinci and expanding Silver Brush. 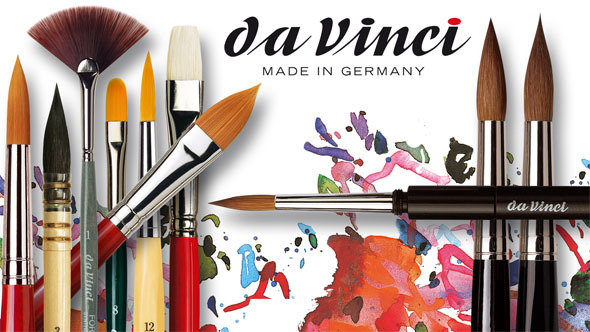 He says, “I”m happy to share that the Da Vinci Brushes have arrived to rave reviews from artists and instructors alike. For you fine art painters, I added the short handled red sable brushes from Silver Brush (excellent for all media). These brushes join the long handled versions favored by detail painters. I’ve also added the Silver Silk 88, a semi stiff synthetic bristle for water media painters including water soluble oil paints”. With so many different types and brands of brushes, Neil offers all of the details at the store and on the website. The Art Sherpa® red handle — made by Silver Brush in partnership with Cinnamon Cooney, The Art Sherpa®. These beauties feature excellent quality stiff white filaments that were specifically designed for use in all acrylic paints, including heavy bodied. Sherpa brushes provide paint and tip control unique to the series. Now you can scrub, scumble and push paint around on your surface without fear of damaging the brush! Silverstone™ brushes are of the finest quality interlocking Chungking white hog bristle. They have perfectly balanced and shaped handles for ultimate comfort and control while a nickeled brass ferrule protects the brush from damage, splitting and wear. ​Cambridge™ series brushes have a unique blend of selected natural bristle and multi-diameter synthetic filaments with a resilient interlocked construction and deep natural chiseled tips. A seamless nickel-plated brass ferrule and carefully balanced handle make the Cambridge series a joy to work with, even on rough surfaces. 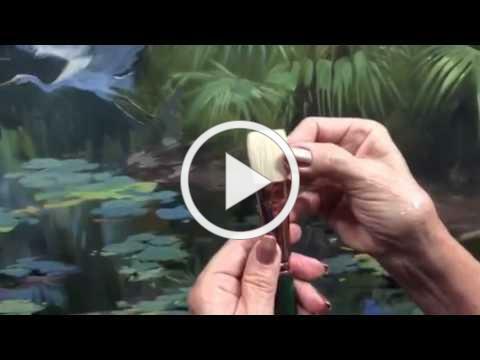 These exceptionally durable brushes work well in heavy bodied acrylics, water-mixable oils, and traditional oil colors. The Atelier™ Mottler brushes feature a blend of badger and synthetic bristles and they are perfect for blending or softening edges. The extra long handle provides reach for work on a large canvas and a rust proof copper ferrule protects the brush. 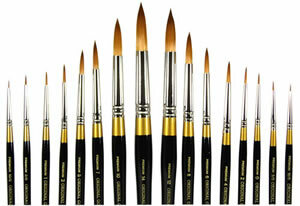 Black Velvet® — distinctive black lacquer handled brushes with a signature silver band are a water-based artist’s dream! The Black Velvet® series is made with a blend of natural squirrel hair and black synthetics that allows the brush to hold a huge amount of color and release it with perfect control for watercolors, gouache, liquid acrylics, inks and dyes. The bristles are simultaneously soft enough to allow multiple-layer glazing without disturbing previous colors, yet firm enough to lift color with a gentle scrub. Grand Prix® brushes are of outstanding quality. Perfectly balanced and shaped, they feature interlocked 100% Chungking white hog bristles for maximum color carrying capacity and corrosion-resistant double crimped pure copper ferrules with an epoxy seal for added protection. The Renaissance® brushes are a top quality kolinsky-class pure red sable brushes with a natural spring and generous color-holding capacity. Renaissance brushes keep a fine point or sharp chisel edge. AS ALWAYS SILVER BRUSHES ARE 40% OFF OUR LIST PRICE. Casaneo Watercolor Brushes made from extra soft synthetic fibers with an extraordinary elasticity and an extremely high color absorbing capacity, manufactured in plastic quills, rounds, flats, oval pointed filberts, and wash brushes bound on black lacquered handles. Spin Synthetics – watercolor brush finest extra smooth light brown synthetic fibre so-called silver ferrule short red transparent lacquered ergonomic handles for all liquid colours, especially for watercolor and silk painting. College – Acrylic brush, round strong synthetic fibre seamless aluminum ferrule brown-red matte finished handles with a new, non-slip surface structure to enlarge our assortment for acrylic and oil painting in the lower price level, we have created this new synthetic line with very elastic synthetic fibers and long brown-red matte finished handles with a new, non-slip surface structure. Maestro 2 – The enormous amount of labour involved in hand making interlocked brushes has led us to develop a new technology, which enables us to manufacture the artist brushes in a more effective way. Top Acryl – white synthetic fibers with interlocking effect, medium length with silver ferrule long natural polished handles.The IMPASTO/TOP ACRYL has been designed to be used with the many texture gels and pastes. Your favorite, high-quality, golden taklon brushes are back in KingArt’s 9000 Series “Original Gold” premium brush line. KingArt, part of the Cornell* family, has created an exciting line of premium, golden taklon artist brushes at fantastic prices. Short, black handle brushes with gold bands and silver ferrules. 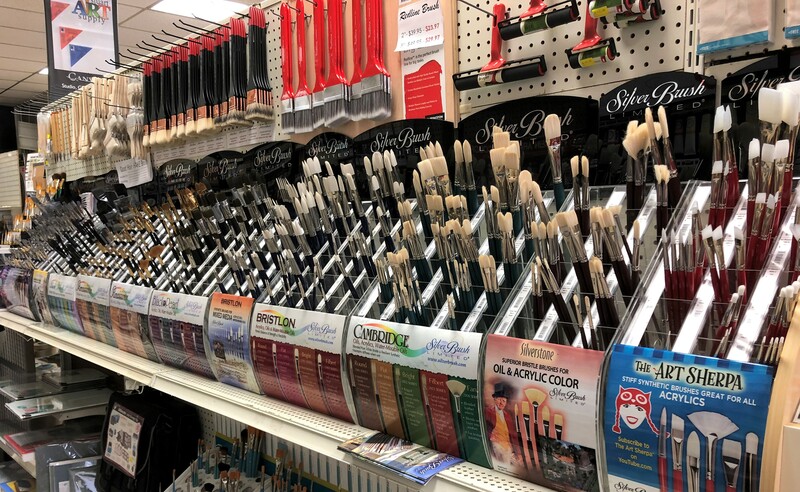 *The Cornell family has re-entered the artist brush business – Michael Cornell – Grandson of the original founder is importing some of the best water media brushes in the world. I especially love the 9020 Max Round (think Loew Cornell Ultra-Round).